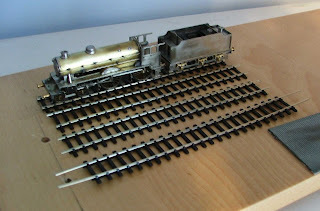 2mm North East Area Group: Get on with some modelling, Simms! Get on with some modelling, Simms! The D49 approaches the finish line albeit rather slowly. While I've been sticking small details onto the loco body, the chassis has been running in. Here you can see the addition of; cab side steps, buffers, steam pipes from the boiler to the cylinders, smokebox door, chimney and dome. There are still a fair number of items to go; front steps, grab handles, whistle, valves, Wakefield lubricators, not to mention the cab roof. I also need to fabricate a backhead to go in the cab.